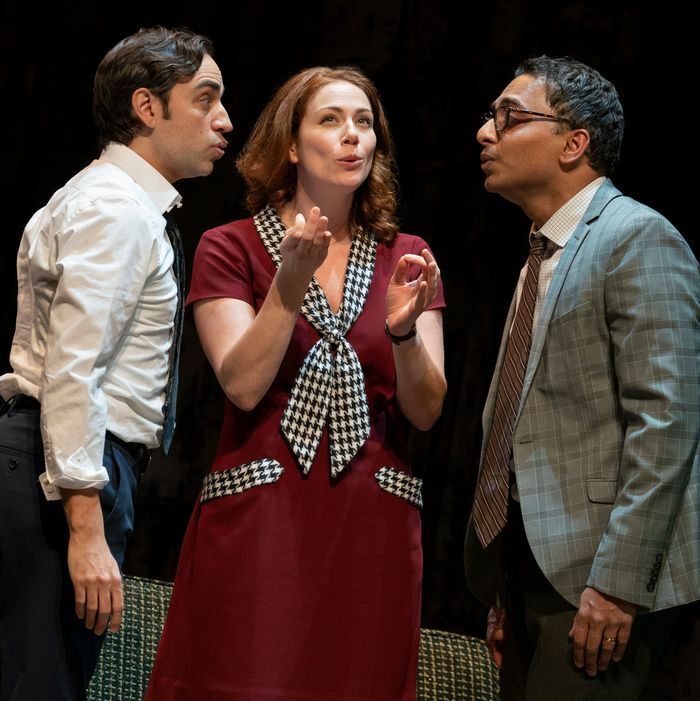 Merrily We Roll Along, for those who haven’t seen the recent documentary on the original Broadway production or perhaps even Lady Bird, moves backward in time through the lives of a trio of baby-boomer friends. We watch Frank, Charley, and Mary go from financial success and personal despair back to their youthful, 20-something hopefulness. Fiasco’s version, currently in previews at the Laura Pels Theatre and opening February 19, streamlines the material down to fit a cast of six actors, cuts the intermission, and sets the action within a sort of costume-and-prop warehouse. Vulture spoke with Steinfeld, Jessie Austrian (who plays Mary), and director Noah Brody to hear the key steps that went into their take on Merrily. Since 1981, Merrily has lived through productions and rewrites with James Lapine in San Diego in 1985, in D.C. in 1990, Off Broadway in 1994, in London in 2000 (where it won an Olivier Award for Best Musical), and more recently in an Encores! Production in New York in 2012. According to Austrian, Fiasco’s Merrily is “a pretty even blend” of the ’81 and ’94 versions, though it also incorporates moments from the musical’s own source material: the Kaufman and Hart play that premiered on Broadway in 1934. In conversations with Sondheim, the composer mentioned to the Fiasco team that the musical missed the darkness of a scene in the Kaufman and Hart version where Frank and his first wife Beth live together in desperation with her parents. So they decided to incorporate more from that period in Frank’s life into their version. “That has changed entirely in my relationship to understanding why Frank makes some of the decisions he does earlier in the story, and how they play out later,” Steinfeld said.